Gomes grateful for Hoffenheim's "faith"
Sinsheim - 1899 Hoffenheim have experienced their fair share of difficulties this season, with Markus Babbel's dismissal as head coach and Boris Vukcevic suffering life-threatening injuries in a car-crash. Yet 2013 has seen the club enter comparatively calmer waters and, for one recruit at least, Sinsheim has offered a route back from relative obscurity. Goalkeeper Heurelho Gomes joined on loan in January from English side Tottenham Hotspur FC and, in an exclusive interview with bundesliga.com, the 31-year-old reveals his joy at being back between the sticks in one of Europe's top leagues. bundesliga.com: Heurelho Gomes, after an impressive debut against Freiburg two weeks ago, you went down to a narrow defeat at the hands of Hannover. How pleased have you been with your performances for Hoffenheim so far? 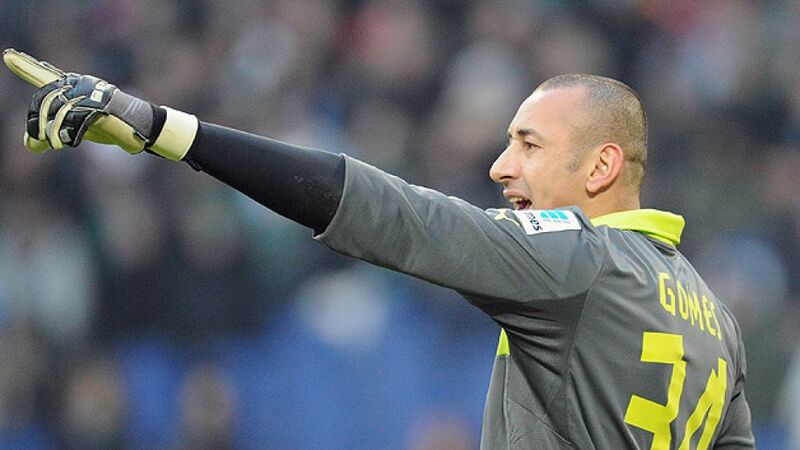 Heurelho Gomes: Given the circumstances surrounding my move to Hoffenheim, I am quite satisfied with my performances. The defeat at Hannover was hard to take for all of us. We conceded an unfortunate goal, but we still had our chances to get back into the game. Unfortunately we couldn't take them. Now we need to focus and believe we can beat Stuttgart on Sunday. bundesliga.com: What are your first impressions of the Bundesliga? Gomes: Looking at the level of competition, the Bundesliga has improved to be one of the best leagues in the world, no doubt. Besides that, the level of infrastructure and organisation is great in Germany, as with the Bundesliga, and it makes it a great place to be for the players and fans. bundesliga.com: What did you know of German football and Hoffenheim before you came here? Gomes: A good friend of mine has been playing in the Bundesliga for over five years now - Josue at VfL Wolfsburg - so I know what’s going on in German football. I have even watched some of Wolfsburg’s games on TV recently. Besides that, since my time in the Netherlands [at PSV Eindhoven from 2005-2008] I have always been interested in the Bundesliga. bundesliga.com: What made you decide to come to Hoffenheim on loan from Tottenham? Gomes: I didn't really have much time to think about it. What helped was that I'd spoken to Gylfi Sigurdsson, a former Hoffenheim player at Tottenham, about the club before. The discussions with Hoffenheim’s representatives went well. They seemed to have faith in my ability. bundesliga.com: You've been a professional for over a decade now. Have you ever been involved in a relegation battle before? Gomes: No, I haven’t. The closest thing to that in my experience are the knockout rounds of the UEFA Champions League, where two games decide if you progress or it’s over. To be honest, right now I’m not thinking about relegation. We have 13 more games to play and plenty of points to gain. I'm sure we can still catch the teams ahead of us. bundesliga.com: Could you envisage staying in Germany beyond the end of the season? Gomes: I’ve not even been here two weeks, so I’m not going to talk about that at the moment. I have a contract at Tottenham, but I have a loan agreement for the next four months here in Hoffenheim and will do everything I can do to help this club stay in the league. I’m not thinking any further ahead. bundesliga.com: Have you learned any German yet? What is the funniest thing you can say? Gomes: I try to pick up the odd word, yes. Funny? ‘Leo’ sounds like a funny word - it’s what the goalkeeper shouts when going for the ball in the penalty box. It's great that almost everybody here speaks English very well and due to the various Latin Americans in the squad, I can even speak in my native language. bundesliga.com: Is playing for Brazil at the 2014 FIFA World Cup still a dream of yours? Gomes: I never say never. Of course I'd like to be involved and wouldn't say no, but realistically I’m likely to be one of the millions of fans.